Scroll down to read more detailed descriptions and to link to screenshots showing examples of these capabilities. Convert 450 units in 48 categories, and add more of your own. Special conversion calculators for mass/volume flowrate, kinematic to dynamic viscosity, steel hardness, fractional inches, Gas Constant and Reynolds No. Testing the Uconeer unit converter is risk free. Download and test the free, but fully functional, trial version for 30 days before you make the decision to buy. After your purchase you are covered by our 30 day money back guarantee. No questions asked. And if Uconeer is upgraded tomorrow you get that free too. In fact all upgrades are free for 12 months after purchase. No risks, just great software. Uconeer is a professional unit conversion software package designed specifically for engineers. It includes a wide range of technical measurement categories required by engineers, but it excludes the archaic and esoteric units that clutter the menus of the other conversion programs. However, if we have left out the particular measurement units that you do need you can add them in yourself, allowing you to convert units that are particular to your industry or location. Replace your unit conversion tables with this free-to-try unit converter download. Uconeer includes conversion factors for all the standard categories like Acceleration, Area, Force, Fuel Consumption, Length, Mass, Power, Pressure, Temperature, Velocity (Speed) and Volume. In addition to the standard categories Uconeer includes conversion factors for engineering measurement units like Diffusivity, Enthalpy, Entropy, Fouling Factor, Heat Capacity, Heat Transfer Coefficient, Moment of Inertia, Stress, Surface Tension, Thermal Conductivity, Valve Sizing Coefficient, Friction Factor, Torque and Viscosity. See full list of measurement categories. Includes accurate and consistent conversion factors for more than 450 units in 48 categories. 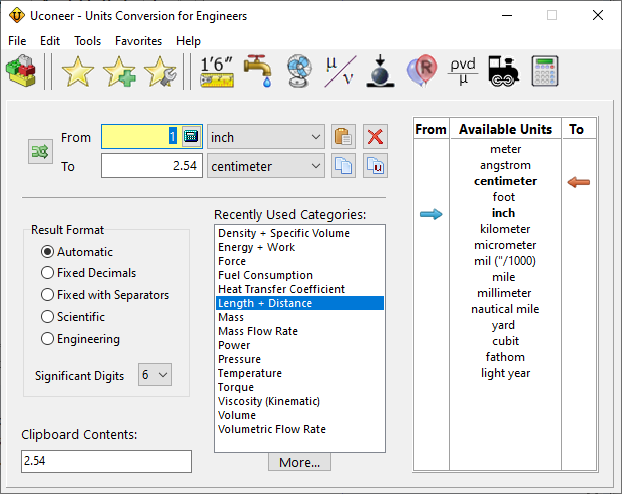 Includes only the practical engineering unit conversion factors in each category, making them quick and easy to select. Will convert units for measurements in SI Units, Metric Units, Imperial Units, British Engineering Units and US Customary Units. And you can add in up to 5 custom units in each category. Custom units can be exported, merged and imported to facilitate standardization of unit conversions for an office or project. (Screenshot of custom units editor). Here is an article on how to calculate your own conversion factors. Convert units between density and specific volume. Flexible formatting of output, including scientific and engineering notation for converted units. Full support for clipboard, with clipboard contents always shown on screen. Allows you to easily import values for conversion, and to paste converted measurements and unit labels into other programs. Small download size - only 2.0 Mb. Totally self-contained with no dependence on any frameworks, run-time libraries or DLLs. Purchase Uconeer together with our AioFlo Pipe Sizing Software and save $10 on a single user license. This gives you AioFlo for only $20. Bundle site licenses or enterprise licenses of Uconeer and AioFlo for even larger savings. See purchase page for full pricing details and links to place your order. Added "Copy" button on "Convert to Feet & Inches"
Version 1.5 Sept 2001 Fixed bug in Feet & Inches Calculator. This was giving errors when converting to integral inches. Version 1.4 Aug 2001 Added Energy units basis to Gas Constant Calculator. Added nautical miles and knots. Version 1.3 July 2001 Fixed bug in display of decimal places. Version 1.2 June 2001 Added barrels/day and USgpm to flowrate category. Removed barrels/sec and USgal/sec from flowrate category. Version 1.1 May 2001 Added liquid volumetric / mass flowrate converter. Version 1.0 Jan 2001 First public release. Is Uconeer the best unit converter software available? Many of our users have written to us to tell us that Uconeer is the best unit conversion calculator they have ever used. But of course, what is best for you will depend on your needs. Uconeer was designed for engineering, technical and scientific users who need frequent, accurate, reliable and consistent conversions of the practical units and measurements that they use on a daily basis. It has been carefully thought out to minimize the clicking and scrolling that are characteristic of many other conversion programs. If you are this type of user then we are confident that Uconeer will be the best unit converter for you.